Tags: hospice, National Hospice and Palliative Care Organization, and NHPCO. 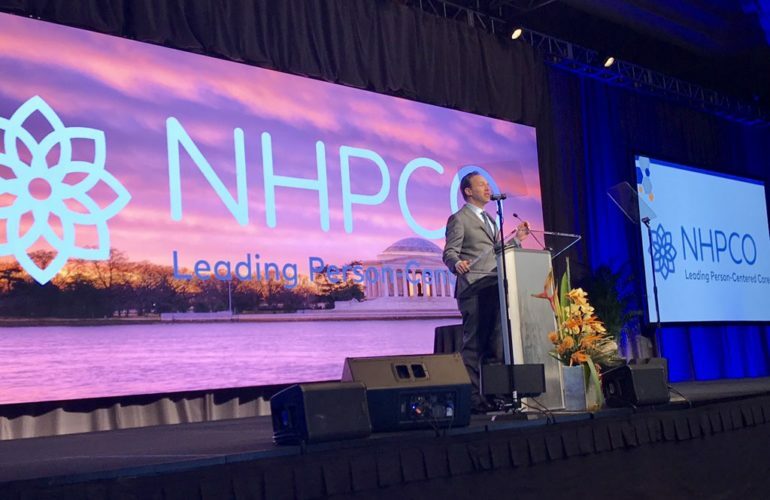 NHPCO’s Edo Banach unveils the organization’s new branding. 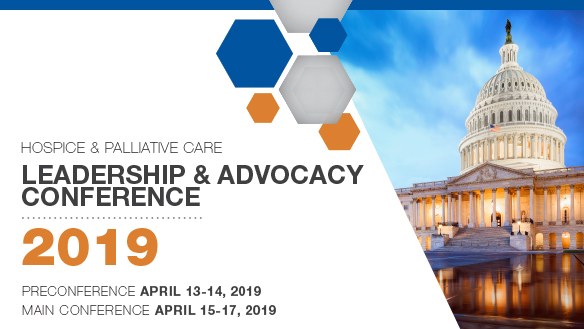 Today, the National Hospice and Palliative Care Organization welcomes 1,400 hospice and palliative care leaders, managers, and advocates to its 2019 Leadership and Advocacy Conference (April 15 – 17) at the Marriott Wardman Park in Washington, DC. During the opening plenary session, President and CEO Edo Banach unveiled the organization’s new branding that has been under development for the past year. Branding efforts have been designed to reinforce three key organizational messages as outlined below. OUR POSITION: Founded in 1978, NHPCO is the nation’s largest membership organization for providers and professionals who care for people affected by serious and life-limiting illness. NHPCO serves its field with a purposeful agenda and unified voice to advance an integrated, person-centered healthcare model. 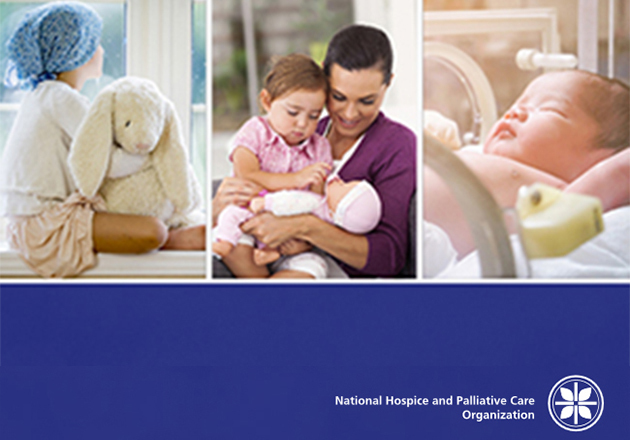 OUR PURPOSE: NHPCO gives ongoing inspiration, practical guidance, regulatory support, and legislative representation to hospice and palliative care providers so they can enrich experiences for patients and easy caregiving responsibilities and emotional stress for families. NHPCO provides its members with the essential tools they need to stay current with leading practices, understand policy changes, and improve their quality of care. OUR PROMISE: As an essential resource for hospice and palliative care providers, NHPCO works to expand access to a proven person-centered model for health care – one that provides patients and their loved ones with comfort, peace, and dignity during life’s most intimate and vulnerable experiences. The conference marks the release of the key messaging and new logos and organizational graphics. A redesigned website will launch in the weeks ahead. A highlight of the conference is the release of new resources available to the NHPCO membership. Notably, the new Palliative Care Playbook which has been created for hospices who are currently providing or looking to expand services into the provision of community-based palliative care. Content includes needs assessment, business case, legal and regulatory considerations, quality and data, staffing, budgets, documentation, reimbursement, etc. A section of resources and practical tools is also included. “As NHPCO’s primary palliative care resource, the Playbook will be updated annually to stay current with the ever-changing healthcare landscape,” said Lori Bishop, MHA, BSN, RN, vice president, palliative and advanced care. The Playbook is electronic and available for free download by NHPCO members. Additional technical resources that will be released during the conference include: A resource for Management of Imminent Death Care in Hospice; the Hospice Quality Reporting Program FAQ Index; and the Guide to Patient Travel in Hospice Care. All available for download, free-of-charge to NHPCO members. As part of the conference, NHPCO and affiliate the Hospice Action Network will host a series of advocacy training sessions and take 300 hospice advocates, representing 48 states, to Capitol Hill on Wednesday, April 17, to hold more than 350 meetings with Congressional offices. Wednesday morning will begin with an address by Deputy Secretary of Health and Human Services Eric D. Hargan followed by remarks for Senator Ben Cardin (D-MD). The day will end with a congressional reception at the Russell Senate Building in the historic Kennedy Caucus Room. 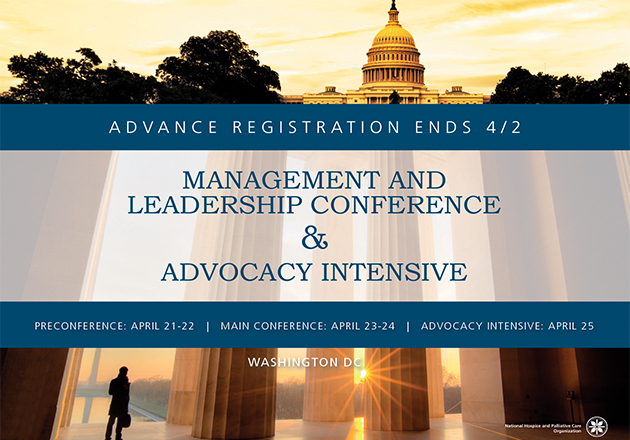 The conference will also include the National Hospice Foundation Gala at the Marriott Wardman Park on Tuesday evening, April 16. This year’s event will include dinner, drinks, entertainment and an auction, with a live appeal supporting NHPCO Veteran services and programs. NHPCO would like to thank the following organizations that have provided their generous support for the Leadership and Advocacy Conference. Please visit with them in the Exhibit Hall and learn more about them in the Exhibitor section of the Mobile App. Gold Level: Cambia Health Foundation; Enclara Pharmacia; Optum Hospice Pharmacy Services; and Simione Healthcare Consultants, LLC. Silver Level: Brightree; HospiceMD, Inc.; Hospice Pharmacy Solutions; and OnePoint Patient Care. Bronze Level: Fazzi Associates; KanTime; LINET; The Joint Commission; and Wizard Creations. Copper Level: Axxess; Cardinal Health™ at-Home; and National HME. Pewter Level: CarePartners in partnership with Intalere; and Hospice Source.